A hospital’s clinical staff is the most valuable asset to their organization. They are the heart of the institution that makes the hospital run. A staff member’s time is spread thin between caring for patients, attending meetings, documenting information, and responding to calls and problems throughout the hospital. With so many variable processes taking place throughout the hospital, a Real-Time Location System (RTLS) identifies the location of clinical staff members throughout the facility and integrates with your nurse call system to improve workflow, patient response times, automate records, and keep staff safe. Workflow enhancements: On average, nurses walk up to 5 miles per day on the hospital floors. They are called in multiple directions at once and have on average 72 tasks per hour (Westbrook et al. BMC Health Services Research 2011). Their time spent doing paperwork, searching for support staff or assets, and responding to interruptions decreases the time they have to provide direct patient care. RTLS staff tracking and nurse call integration helps eliminate wasted time and increase efficiency to automate workflow processes. Nurse call corridor lights illuminate when a patient makes a call from their pillow speaker or bath station. Nurses are notified regarding the type of call that was placed via their wireless phone and the corridor light over the patient’s door. When a caregiver enters the patient room the RTLS enabled staff badge cancels the call and time-records their arrival, therefore enabling a handsfree enhancement to workflow. Patient response improvements: Patient response times are critical to patient care. When a caregiver enters the room their presence is documented and the nurse call corridor light illuminates a different color showcasing to other staff members that a caregiver is present. If the call has not been answered, the corridor light will continue to either blink or beep to indicate that the call is still active to staff. With RTLS technology, monitors display the exact location of the caregivers on shift, so in the case the assigned caregiver cannot respond, staff can contact one closest to that patient room to assist. This helps speed up the process and increase patient response times. Automate location accuracy: When a caregiver enters a patient room, the RTLS platform records their precise location. The amount of time spent in the patient’s room from entrance to exit can also be recorded to help establish better workflow processes, understand patient call response times, and be used for documentation protecting the hospital in the case of liability. Staff safety: With the increase of crime and tightened regulations, there have become more security challenges for hospitals. RTLS staff duress badges help protect staff when they feel threatened or are dealing with a possible fall risk or highly medicated patient where they are in need for further assistance. The staff badge has a duress/assist button they can press to get immediate help to their exact location. 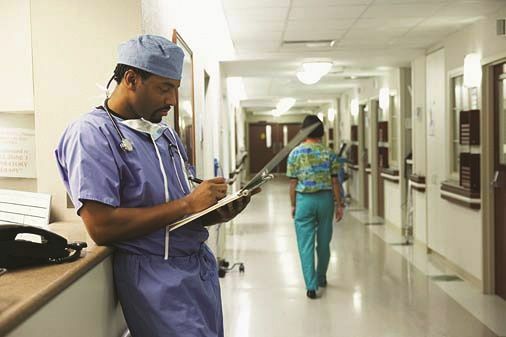 No matter the hospital department, staff locating is a valuable tool that helps streamline workflow processes, enable faster patient response times, document time and location of staff, and eliminate wasted steps so the caregiver can spend more time with their patients. A happier, safer staff member with more efficient solutions leads to enhanced patient care for the entire hospital.